In November we delivered a check in the amount of $1,088.10 from our Fairview CC Missions Dept. Last Sunday, we dedicated the toys donated for the Northland Christmas Store, a collaborative assistance for families in need this Christmas. The toy count was 105 & they are still coming in. They were really great toys. Toys, food, and other assistance are given out at the beginning of December for families who get to shop for their kids and kids for their parents. You'll see the toys we collected and dedicated pictured above, with train sets, stuffed animals, science kits, and much more. Come hear Christmas music as performed by the 5 Star Jazz Band under the leadership of Fairview’s own Bob Drummond. The band will start performing at about 6:30 p.m. Invite your friends & neighbors to an evening of great music. We will have ornaments available for you to sign, decorate, and/or embellish and then place on the empty tree in the Fellowship Hall. What a way to shine together during this season of Advent and to celebrate the blessing of Christmas. Hope to see you December 11. It's time to start thinking about the Northland Christmas Store. Christmas will be here soon & once again we will have the Classic Crowd tradition of having the Antioch Middle School Choir to serenade us with Christmas Music! Due to the Thursday’s early release at the school, we will have the program first and eat afterward. Make sure you are in place before 11:45 AM so you can enjoy this great program! We will enjoy a Holiday dinner of ham and all the "fixins" and desserts that you bring to go with it. Start off the season with dinner and music on December 8th with Classic Crowd. If you’ve always wanted to see what goes on with Micah Ministry, here is your chance. We can always use more volunteers, so please feel free to check us out. We will meet at Fairview on Monday, Dec. 5th at 4:15 p.m. If you have lost a loved one this year you are invited to participate in Fairview’s Holiday Remembrance Service, Sunday, December 4th. CMF monthly breakfast will be in the Fellowship Hall on Saturday, December 3rd starting at their new time of 9 a.m.
Come join Fairview men for great food and fellowship. Bring your friends & neighbors. Mark your calendars! We are once again collecting unwrapped toys for the Northland Christmas Store. You can drop them off between now and Sunday, December 4th. Our toy dedication will be held on Sunday, November 27th. Toys should be valued at $20 or more for infants up to 12 year olds. Gift cards will be given to 13-18 year olds. If you have any questions, please contact Myrna G., or call the office. Remember to share this post with your family and friends! Troop 155 will be at Price Chopper in Gladstone between 6:00 a.m. to 3:00 p.m. collecting turkeys & non-perishable food items. Part of the dinner (turkey, mashed potatoes & gravy, & dressing) will be catered. Fairview will also provide rolls & drinks. Please bring a dish or two to share (salad, vegetable or dessert). 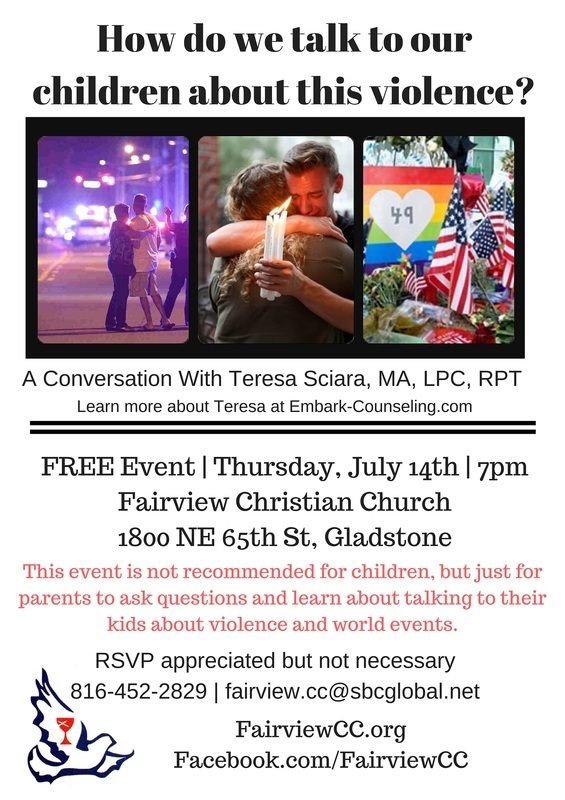 All our Fairview family, friends & visitors are invited! We hope you will attend. Join us to celebrate and pay tribute to ALL of our Veterans and First Responders and help raise monies for Scouts from Troop 155 to go to summer camp. So come out & support our Scouts! Your gift to the Thanksgiving Offering helps underwrite the education of students attending our undergraduate institutions & our seminaries or divinity houses. Coming home to a Disciples College or Theological School is possible through the scholarships & grants that are made available by generous individuals, the Disciples Mission Fund & your gifts. Our entertainment will be Ken Page with Mad Hat Productions (music & entertainment). ​Don’t miss this event. We’ll be looking for YOU! In November there will be opportunities to get involved with things in & around Fairview Christian Church! This Sun., Nov. 6th & again on Sun., Nov.13th, our annual volunteer sign-up will occur during Koffee Klatch in the Fellowship Hall. wonderful and positive things going on at Fairview. Look for the insert in Sunday’s Christian Church Visitor that explains the functions of each department/committee. ​So look for the sign-up sheets during Koffee Klatch. 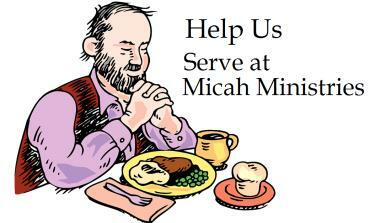 Fairview will be helping to serve at Micah Ministries, we will meet at Fairview on Mon., Nov. 7th at 4:15 p.m.
Come join Fairview men for great food & fellowship. Bring your friends & neighbors. Meal will be roast beef, mashed potatoes, gravy, vegetable, roll, drink & desert. Tickets will be on sale during Koffee Klatch on Sun., Oct. 16th & Sun., Oct. 23rd. This year, Fairview Christian Church will be partnering with Meadowbrook Elementary School. We will be doing Trunk or Treat on Thurs., Oct. 27th at Meadowbrook starting at 6:00 p.m. Fairview’s Church Growth will be coordinating. Wear your masks, decorate your trunks or come as you are! It will be a lot of fun! You need to supply your own candy to hand out. If you’re not able to participate on Oct. 27th, but would like to donate candy to be passed out, please drop it off in the Church office -- NO later than October 23rd. Fairview’s Scout Troop 155 will also be partnering with Meadowbrook on Oct. 27th for Trunk or Treat. It’s a time of fellowship with a little business thrown in. We will be collecting paper products for MLM this month. With Fall finally here in full swing, the youth and children of the church will be going to the Kearney Fun Farm on October 22, from 1-4:30pm. Activities will include a corn maze, a corn pit, a jumping pillow, and more. Please let Pastor Travis know if you are able to come so we can provide adequate transportation. Drawing for the ‘’Opportunity Quilt’ will be at Fairview’s Nov. 20th Annual Thanksgiving Dinner. We are going to have a good, old fashioned family reunion. Your Fairview church family. And some of your personal family as well, we hope. It will be a very special day. It is hoped that many will bring some of their own family members, like your ‘kids’ who maybe grew up in the church, grandchildren, the “greats” or other “kin.” They can renew old friendships. And to former members of the church — you are encouraged to attend. You still have friends at Fairview. Even if you are attending a different church, Fairview folks would enjoy seeing you again. Yeah, some will say “we miss you,” give you big hugs, but no one will ask you to sign a pledge card—guaranteed. This would also be a good Sunday to invite friends to worship with you. Guests are always welcome, but might be more likely to attend if you invited them for this special Sunday. Things that can be helpful — pick up someone in the church who cannot drive themselves; call the church office if you would like to have a ride; let folks know who are not on the church mailing ist; lean on your kids a little bit that you would like to sit with your family in church once again; make a real effort to bring a friend; help with Koffee Klatch. Most importantly — be there. “There’s quite enough love for all of us” at Fairview. If you can help, in any way, to get ready for the fall bazaar please attend. Come join the men of Fairview for great food & fellowship. AND, bring a friend or neighbor. Entertainment: back by popular demand will be The Raymers. Since Micah Ministry is usually closed for the Monday holiday the first Monday in September, we will serve on the fifth Mon. of August, the 29th. So if first Mondays do not usually work for you and you would like to try it, please come! Meet at the church at 4:15 p.m. to depart for Micah no later than 4:30 p.m.
We will leave Fairview at 12:30, stopping for lunch at Johnny’s Italian Steakhouse. We will leave the restaurant at 2:30pm to go to the Chestnut Theater in Olathe, Kansas to see “Two Zany Redheads”. See flyers on bulletin boards for pricing and more details. Join us for our Coffee and Ice Cream With a Cop event. The Scouts and our neighborhood will be invited to free ice cream and a chance to meet our Gladstone Police Officers. No agendas, no speeches, just coffee, cake, ice cream and conversation with some of Gladstone’s Finest. UPDATE: We estimate about 300 people showed up for this event. Thank you to all who participated. the fried chicken, drinks and table service. Please bring a side dish and/or dessert to share. If you have not attended one of our luncheons previously, here is what to expect. Each person (or family) normally brings a pot luck dish. Whether you make it "from scratch" or pick something up from the grocery store deli or bakery is up to you. ​We will have a free will donation basket to help cover the cost of the chicken. 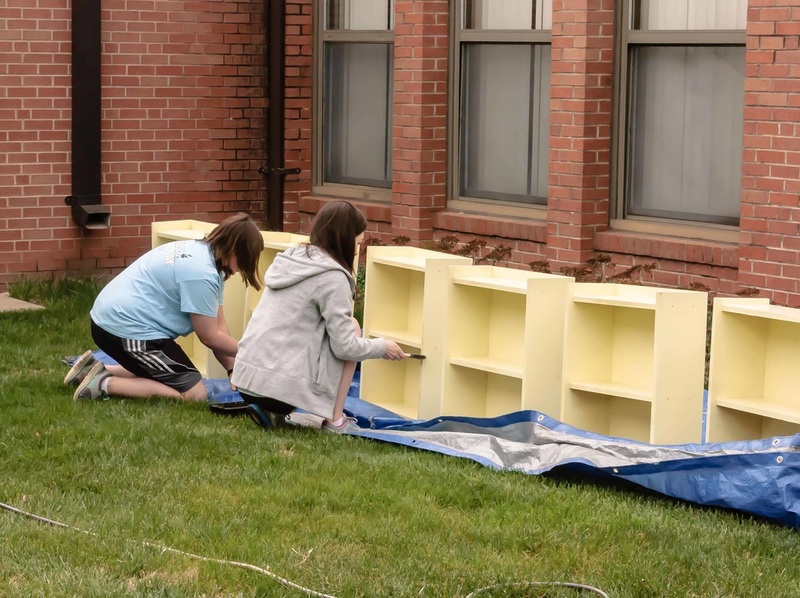 We assembled AND painted 40 bookshelves on Saturday. We had lots of help from William Jewell students on their day of service and many folks from Gladstone Rotary. Plus, Englewood Baptist provided some delicious snacks. These shelves will go to students in Chris H's ELL classroom at Northgate Middle school. Thank you so much for contributing to the T-Shirt project for the Clay County Clothes Closet. Over 73 t-shirts, of all sizes, were collected & then delivered to the Clay County Clothes Closet ! We will meet at 4:15pm in the parking lot by the office and leave by 4:30pm to go to Micah. Fairview will once again be helping with a joint Vacation Bible School with Park Hill Christian Church. VBS will be from Sunday, July 17th thru Thursday, July 21st at Park Hill Christian Church. 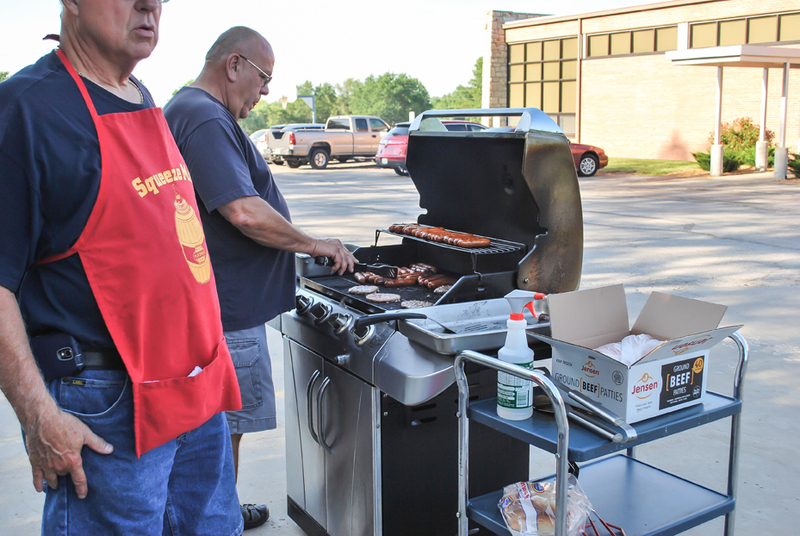 Once again this year, there will be NO CHARGE for VBS, including a snack supper every night. Our fun each day will begin at 5:15 p.m. with the snack supper & the day will end at 8:00 p.m.
welcome – they will be included in all of the fun as “Volunteer Assistant Crew Leaders”. Pastor Kassie or Pastor Travis if you have questions. Completed registration forms are due into the office no later than Monday, July 11th. Meal will be fried chicken plus your potluck dishes. Our entertainment will be Gary Kirkland who has performed for Classic Crowd before and is one of our favorites. Not meeting on July 4th. The rest of us will be in the Fellowship Hall -- where it is cooler. 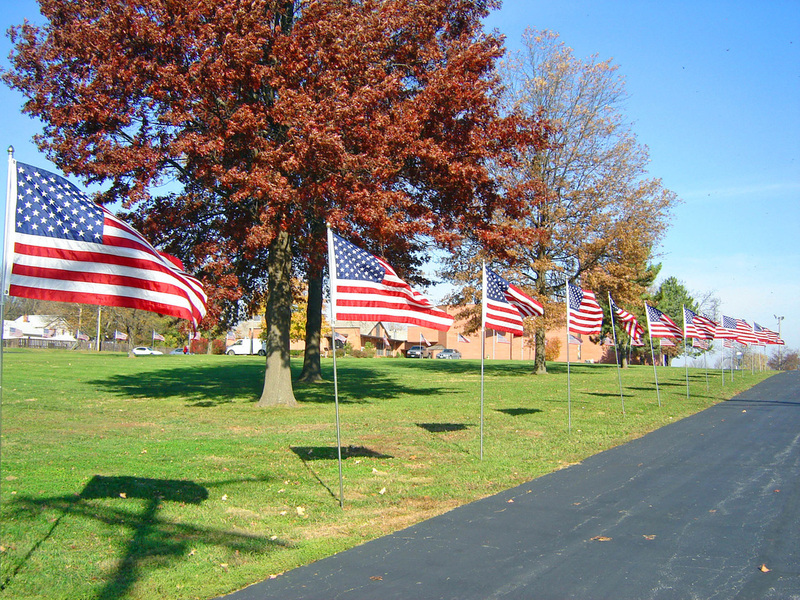 Weather permitting, flags will go up at 7 a.m. & be taken down at 5:30 p.m. So if you’re available & can help us, we hope to see you at Fairview. We will be having a taco bar, drinks and dessert. Cost will be a free will donation. Hosted by Membership Department. Contact Lynn C., with any questions. Join the Scouts at Fairview Christian Church for a day of FUN and Adventure. Fundraisers, games, water slide, Kansas City Zoomobile. The KC Zoomobile will be visiting just after lunch time. ​Food will be available - cost is donations accepted. Our youth from Fairview are going to go bowling on May 15th at Liberty Bowl from 1-3pm. We've reserved lanes, so please let us know you're coming so we can arrange transportation. We will provide the meal. being involved in the fun things we have at Fairview. We will provide the fried chicken for our meal that will go with the fabulous potluck dishes you bring. performing all types of music. So start planning your covered dish or dessert and be there for a great time. Join Fairview's CMF for our monthly breakfast event. Be part of a great group enjoying a hearty breakfast & great fellowship. You’ll never leave hungry or unfulfilled. If you’re a CMF regular, we look forward to seeing you on the 2nd. If you haven’t yet experienced this great activity, or slept in lately, it’s time to get motivated & join a great gathering. We will meet at Fairview on Monday, April 4th at 4:15 p.m. Then we will leave by 4:30pm to get there. There will be coffee, ice cream & toppings. a short CWF business meeting. Ticket prices are $9.00. These will be sold during Koffee Klatch on April 3rd,10th and 17th. Menu will include chicken salad, croissant, fruit and a pasta salad with cheese cake as dessert....... all to be served by CMF. Following dinner, musical entertainment will be provided by "Cool Breeze". Come and join us for a fun evening. What a successful project for the CWF Priscilla Group & we couldn’t have done it without all of your help! We were able to collect & deliver over 165 pieces of bags & luggage which will be given to children & teens that are helped by services provided thru Synergy. On behalf of the youth that will benefit from this project — Thank You! The bookshelf project we did last year is back again! We're building bookshelves for English Language Learners (ELL) Students at Northgate Middle School. This is the same group that we've been tutoring with. bookshelves. Talk to Bob Howe or Dave Bennett for other supplies. Thanks for helping kids develop a lifelong love of reading and serving with those in our community. April is fast approaching & Classic Crowd will be here before we know it. April 14th is the date 11:30 a.m. is the time with Ham and Beans as the main course. Entertainment will be the Sunshine Singers. Pastor Kassie will leading a two-part class about Facebook the first two Saturdays in April, the 2nd and 9th, at 10:00am in the Fellowship Hall. This idea came about through conversation with church members about the church’s Facebook page. The first session will be about the basics and privacy and security settings. The second session will be about how to connect with people and organizations and how to share things. If you are interested in attending or if you use Facebook and want to help people one on one in the class, please let Pastor Kassie know. Please donate duffel bags, sports bags, backpacks, and luggage to be given to children and teens who have been removed from their homes because of abuse or neglect, or are homeless. These children often have only a grocery or trash sack to keep their belongings. Having a bag they can close or zip to keep their meager belongings together gives them a sense of dignity. The bags also help keep their few treasures safe. Good condition duffel bags, sports bags, backpacks and luggage will be given to the children and teens helped by Synergy Services. Please bring the bags, backpacks and luggage to the Craft Room before April 1st. Thank you Fairview for 165 bags of all sizes. 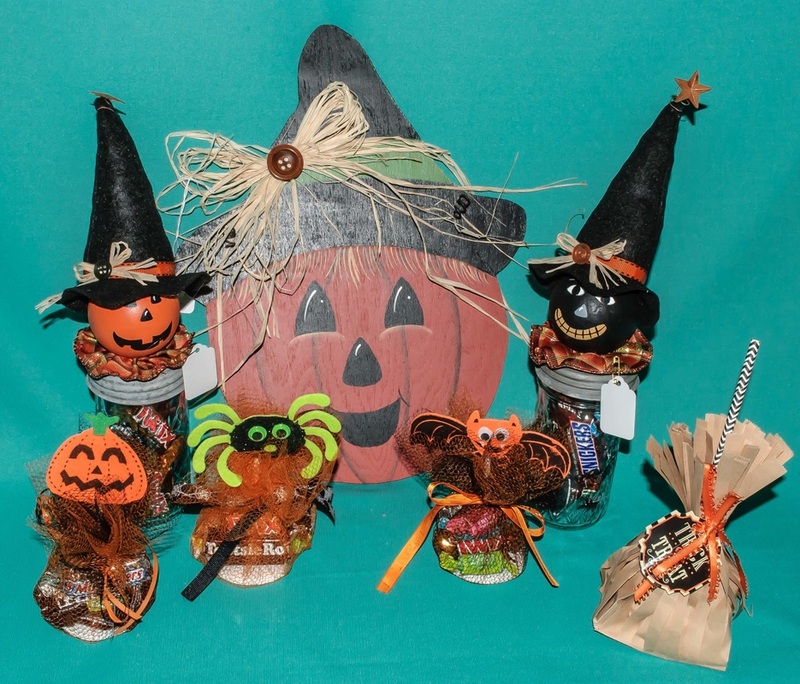 Need to receive candy donations (individually wrapped pieces) no later than Sun. , March 20th. Also we’ll need some volunteers to help with the event on March 26th. If you can volunteer to help ‘hide’ eggs, or help set up in Fellowship Hall, at 8:00 a.m., please let the office know. Children in 2nd grade or younger, can participate in a craft, eat some cookies, take their picture with the Easter Bunny & have fun with a good old fashioned Easter Egg Hunt. Kids bring your basket, bring your parents & enjoy the fun! KC Metro Men’s Chorus will perform a benefit concert for the Clay County Clothes Closet at Fairview on March 13th . All proceeds generated at this concert will go directly to the Clay County Clothes Closet. KC Metro Men’s Chorus has been performing concerts to benefit charities throughout the area since 2002. Our meal this time will be all of the wonderful potluck dishes that you bring to share. We will meet at Fairview on Mon., March 7th at 4:15 p.m. Then we will leave by 4:30 p.m. to get there. Please bring restaurant sized cans of corn & green beans — for walls & columns. And — cans of spam, tuna, fruit or vegetables (regular size) for staircases, altars & interior walls. Construction begins in January & continues thru February. Once the temple is “destroyed” the food will go to Micah Ministry or MLM Family Food Boxes. So — start shopping & enjoy watching. collected enough money to buy 20 cans to go towards the construction of Solomon’s Temple. How about your Sunday School Class? This offering will be taken Sundays Feb. 21st and 28th. Our denomination takes this special offering thru out the world and a portion of it is used to support services to Refugees. We can help support those who are in position to serve these Refugees. This is your chance to have the best $5 Valentine Brunch in the entire City! 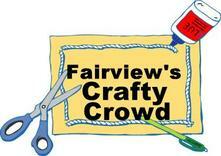 Don’t miss this once a year opportunity hosted by Fairview’s CMF group. Bring your friend, spouse or just come join us. Everyone is invited! Join us for Fried Chicken and your pot luck. Our entertainment will be country music singer Dennis Bowen. The Troop (155) will attend in uniform, all other scouts from Fairview can also be recognized. Clean out your bookshelves & bring books you would like to donate for the Priscilla's Used Book Sale to the church by January 31st. Books can be placed to the left of the stage behind the partition in the Fellowship Hall. Due to our inability to dispose of certain types of books, please do not bring text books or encyclopedias. Do not forget to come back on the 6th to buy more books. We will meet at Fairview on Mon., Feb. 1st at 4:15 p.m. Reminder our next gathering of Fairview’s Bible Study Book Club is Monday, January 25th at 6:00 p.m in the Cornerstone Room. We'll focus on the 1st and 2nd Chronicles. There is NO guide this month. After this meeting we will take a break, due to Lent, and regroup sometime after Easter. Watch the website, Facebook and the newsletter for more information. More details to come....or contact the office. As of the printing of this newsletter, the meal & program are still being determined. BUT the one thing that will be needed is your wonderful, delicious pot luck dishes. We will meet at Fairview on Mon., Jan. 4th at 4:15 p.m.
​Then we will leave by 4:30 p.m. to get there. 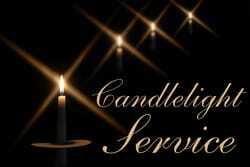 ​If there is inclement weather, Pastor Travis will call regular participants about cancellations. Rest up on New Years Day & get the New Year off to a great start by joining Fairview CMF for our monthly breakfast event on Sat., Jan. 2nd at 8:00 a.m. in the Fellowship Hall. 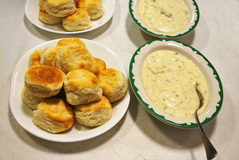 Make a resolution to be part of a great group enjoying a hearty breakfast & great fellowship. You’ll never leave hungry or unfulfilled. See you Sat., January 2nd at 8:00 a.m.!